Capturing breakfast share is one of today's biggest opportunities for both packaged foods makers and restaurant chains. Two-thirds of U.S. consumers eat breakfast; the challenge is understanding the shifting breakfast landscape and what's most important to various consumer segments. Case in point: While Millennials' true level of adventurousness is often exaggerated, when it comes to breakfast, they're indeed more open than other age groups to new concepts, according to research by Datassential. In a recent survey on breakfast dishes, flavors and trends among 1,280 consumers, Millennials showed more interest in all of the breakfast trends tested, including healthier options and ethnically-influenced dishes. Nearly 65% were interested in elevated comfort foods (premium versions of traditional breakfast comfort foods like waffles and biscuits and gravy), and 63% were interested in "monster" or mini breakfast sandwiches. In short, innovative breakfast offerings are key in luring Millennials – a point clearly informing more restaurant menus, including Taco Bell's new breakfast offerings. Also key for restaurants, in particular, is that Millennials are more inclined than any other age group to skip breakfast, and to eat breakfast foods outside of traditional morning breakfast hours. For instance, 16% of Millennials reported eating breakfast items as an afternoon snack, compared to 5% of those in Gen X, 2% of Boomers, and none of the Silent Generation respondents. For restaurant operators, this means that offering breakfast foods during lunch, dinner or snack times may drive Millennial consumption, points out Datassential managing director Maeve Webster. While CPG makers are being increasingly challenged by restaurants' expanding breakfast options, 83% of consumers reported that they ate their last breakfast at home. Overall, consumers reported that time, ease, convenience and health were the most important factors when choosing to eat breakfast at home. They prefer foods that are quick to prepare and eat, while noting that cost is the critical factor deterring them from eating breakfast away from home. At the same time, 65% said that they prefer to make or assemble breakfast from scratch. In other words, manufacturers need to offer convenient, economical products that also cater to consumers' demand for healthy ingredients and preference for scratch preparation – no small feat. Datassential suggests that retail opportunities lie in convenient "speed-scratch" products that allow consumers to prepare or assemble at-home meals more conveniently, such as ready-to-use egg mixes or health and trend-driven carriers like waffle "skinnies." Understanding breakfast flavor and format trends is of course critical for both restaurants and manufacturers. While traditional breakfast favorites like eggs and bacon continue to dominate, Millennials aren't the only ones expanding their horizons. More than half of consumers surveyed expressed interest in key breakfast trends such as elevated comfort foods, single-focus restaurants (such as ones dedicated to artisan donuts) and better-for-you concepts (like egg whites). Also, trends found on lunch and dinner menus are increasingly showing up on breakfast menus, according to Datassential's MenuTrends database. Southern ingredients like pulled pork, sweet potato and cornmeal, as well as ethnic flavors like salsa verde, cotija and plantains, were among the fastest-expanding breakfast options during the past year. Other trends showing major growth include "premiumization" of breakfast items (for example, using premium cheeses like fontina and aged cheddar) and "better-for-you" options. 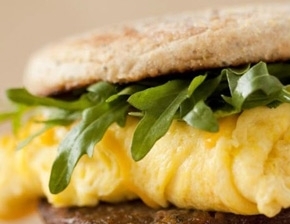 Healthy trends are now seen in breakfast products in supermarkets' perimeter, QSRs and casual chains, the lodging industry and foodservice venues, the researchers point out. The breakfast survey and trends data are from the first report in a new MenuTrends Keynote report series being marketed by Datassential.